1. 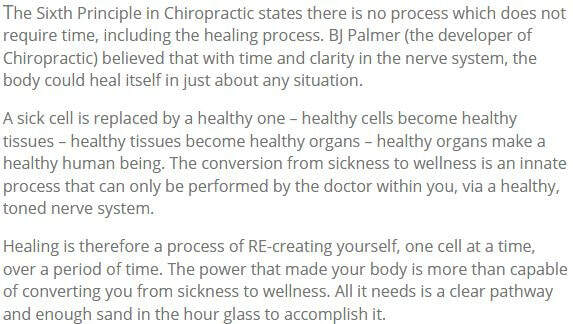 The body is a self-healing mechanism. Cut your finger; it heals. Cut the finger of a corpse; it does not. Life heals. 2. The nervous system is the master system of the body. Every aspect of the human experience is processed through the nervous system. 3. When there is interference with the function of the nervous system, not only can it compromise your physical well-being, but it also can have psycho-emotional consequences because it distorts your perception of the world and limits your ability to respond to the environment. When this happens to a significant number of people in a society, you have a sick society. 4. What we do as chiropractors is locate and correct the cause of that interference. Thank you to Christopher Kent, D.C. for this article. Just as there are many different chiropractic techniques and practice styles, there are many opinions on how regularly one should have their spine checked. Here is the reasoning behind Mind & Body Chiropractic's recommendation of no less than once weekly spinal checks for you and your family. Dr. Ogi Ressel is an international lecturer, a pediatric and x-ray specialist, researcher and clinician. According to an article he wrote to chiropractors around the world, "Many chiropractors often schedule patients for a once-a-month maintenance adjustment based on the idea that monthly maintenance adjustments will help prevent and alleviate many problems. 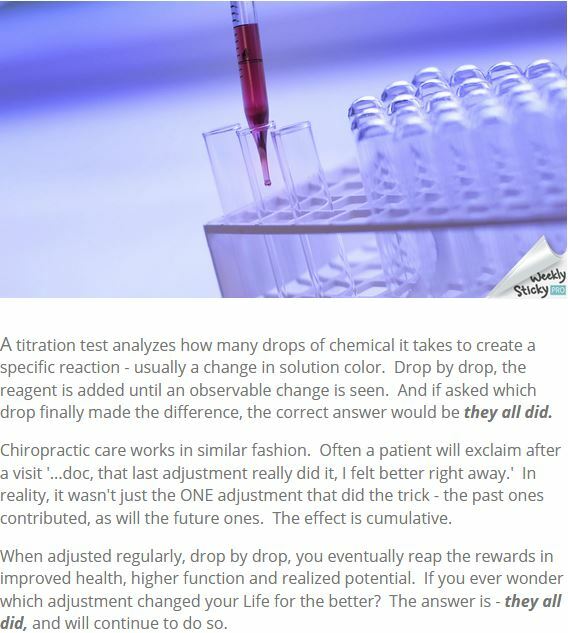 In reality, monthly adjustments are promoted because most chiropractors feel that this is the visit frequency that most people will "buy into" as a preventative measure." 1. First of all, research done by Tapio Vidman, M.D., D.M.Sci., (a Researcher in the University of Alberta's Faculty of Rehabilitation Medicine), tells us that a subluxation, once formed, will cause an inescapable degeneration progression if it is allowed to remain for more than 10-15 days (published in Clinical Biomechanics 1987). Other research on subluxation degeneration, states that microscopic degenerative changes to the hyaline cartilage which surrounds your spinal joints can begin to occur within forty-eight hours of the occurrence of a subluxation! 2. According to Dr. Ressel, "Most doctors do not see their patients on an appropriate schedule of care in order to be able to really correct their subluxation pattern, and it is a pattern. It is a neurological habit the body becomes accustomed to, and it most often starts in children." "Patients need to be placed on a schedule of care that will actually cause their subluxation pattern to be broken. The correction of subluxation patterning is most important in children." For these reasons Mind & Body Chiropractic recommends a spinal check at least once a week you and your family regardless of the presence or absence of pain and symptoms. Thanks to Tony DeCosta, DC and Sasso Family Chiropractic Center for the inspiration behind this article. Science explains the intimate relationship that exists between the spine and central nervous system. Any alteration in the way the spinal vertebrae are aligned or moving will create a stress response in the central nervous system. When this occurs, stress hormones are increased throughout the blood and body. Stress hormones are necessary for survival in a fight or flight situation, but do not provide a good internal environment for growth and development when they are elevated long term. Chiropractic adjustments gently improve the alignment and movement in the spine and allow a reduction in stress hormones. This improves many aspects of health and function and is the reason why every child and adult deserves to understand and experience the benefits of chiropractic. If you placed your hand on the burner of a hot stove, what's the first thing you must do to start the healing process? Sounds simple, but it's true. While your hand is on the stove you can take drugs to kill the pain. You can even eat, exercise, and rest better. But until the hand is taken off the stove, those things may not have any benefit. In fact some might even be downright foolish. You and/or other people can determine what would be right for you. But understand that your hand WON'T begin to heal until it is taken off the offending irritation of the intense heat. Once your hand is taken off the stove do you expect your hand to look, feel, and function normally right away? No! 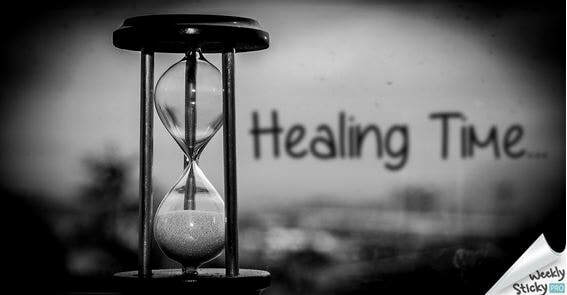 It's going to take time to repair and heal all that damage. The same principle applies to your chiropractic care. A subluxation acts like the burner of the hot stove. It may cause damage, inflammation, and sometimes even pain due to nerve interference. Sometimes there may be no symptoms that you are aware of as the body begins to malfunction. Healing and better functioning can occur only when the offending nerve interference is removed with regular chiropractic adjustments. But that won't necessarily bring instant relief or improved function. Removing the nerve interference is simply the first step in a timely process. So if you don't feel great immediately after your adjustment, don't be discouraged. With time, damaged tissues will have the better potential to heal and your body will function better. For now, be confident that the healing process and improved functioning have at least started because the "hand has been taken off the stove". Chiropractic may very well be one of the least understood philosophies of life and health. 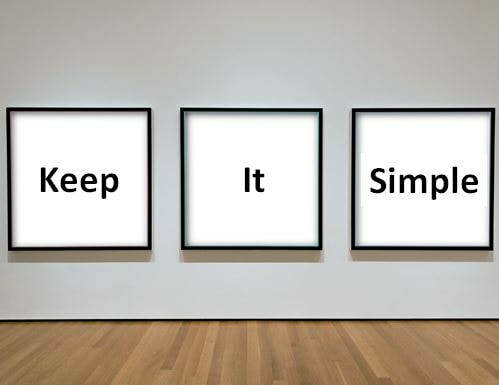 It is based upon a few very simple ideas. The body is designed with an inborn ability to maintain itself in a state of proper function. A newborn baby may seem small, fragile and helpless, but within that body is the ability to make food into living tissue, to heal cuts and bruises, to adapt to changes in the environment, to produce the chemicals necessary to perform every bodily function, to fight off invading organisms, to live as much as 100 or more years, in short, to lead a healthy, productive life. The brain and nerve system are the primary tools by which we attain proper function, what we commonly call health. Every organ, gland and cell in the body depends upon messages carried to and from the brain in order to function in a coordinated manner so that each part can benefit the whole of the body producing a full and abundant life. Interference in the nerve system reduces the body's ability to function in a coordinated manner. While a corpse has a brain and nerve system, it does not have life, there is no power or energy flowing over the nerve system. Similarly, a paralyzed person has lost function due to injury to the nerve system. Even slight damage to the delicate and vital nerve system can reduce the body's ability to function at its fullest potential. A spinal misalignment that interferes with the nerve system (called a vertebral subluxation) creates a reduction in coordinated function. Slight misalignments of the bones of the spine caused by everyday, common activities can interfere with the ability of the nerve system to carry messages that are necessary for the successful accomplishment of those everyday activities, not the least of which is the attainment of maximum health. Chiropractors correct vertebral subluxations. The single objective of the chiropractor is to locate and correct vertebral subluxation in adults and children so that families and entire communities are able to express life at a higher level. If you and your family are not seeing a chiropractor regularly, you are not doing all you could for your life and health. Thanks to Joe Strauss, D.C. for this article. You probably know that chiropractic has something to do with the spine. You may even know that when you lose normal alignment and function in the spine, it causes you to partially lose the proper neurological connection between your brain and body. This then causes the loss of the normal flow of Life Energy in the body and a loss in the ability to purposefully organize your body, which results in losing your natural state of health. Everyday stresses that we are ALL exposed to, that overwhelms the body's resistance, can cause this to occur regularly and in everyone. The scary part is that you rarely ever feel this happen. If you're like most people you have been programmed throughout your life that whenever you go to any kind of doctor, you are there to have something "fixed" so that some illness or pain goes away or is prevented from coming in the first place. In other words, you go to the doctor so that something WON'T happen; to experience LESS of something. But at this office, chiropractic is actually the complete opposite of this! The whole reason for getting adjusted and keeping your neurological connection clear is so that something WILL happen - a more complete expression of health and life! In other words, you go to the chiropractor to experience MORE of something! While results may vary from person to person, some of the most common benefits of regular chiropractic care that people experience more of are: More Energy; Clearer Thinking, Concentration, and Memory; Better Ability to Handle Stress; Improved Physical Performance; Improved Health; Better Sleep; Greater Value From Exercise and your Nutritional Choices; More Balanced Body Chemistry; Better Digestion; ...basically a Greater Enjoyment of Life! Adapted from an article by Stamatis Tsaumoutalidis, D.C. There are several factors related to improving the health and immunity in all people. Many have heard of the importance of a healthy diet, exercise and sleep. An often overlooked factor is the role the nervous system plays in immunity. The nervous system controls and coordinates everything activity in the body, including those related to immunity. Slight, spinal misalignments which often occur with no signs and symptoms (known as vertebral subluxations) cause tension and interference to this powerful nervous system and always cause your body to work at less than its full potential. The chiropractic adjustment reduces and removes this interference to restore proper function and allows your entire body to perform at a higher level. Start boosting your immunity with regular Chiropractic care today!